Not the cobbled road, prefer the uncertainty and non-conformist tackle the prejudices that exist about form and space. Non-figurative forms in metal. Monumental statues and smaller sculptures, welded and forced out of sheet or cast in bronze. Static to dynamic. How modern classical can be. Discover the truth in sculpture. 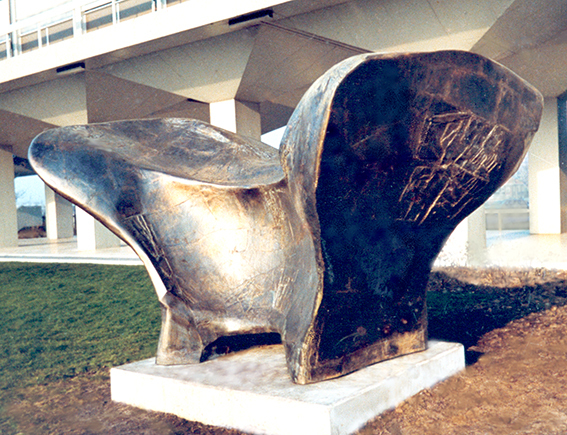 The sculptures are forms in space: They also highlight that space. Stability by simplicity. A sharp standing voltage by the relationship of the volumes and refined lines game. From the thought come to figurative abstraction solutions. Robust and at the same time sophisticated. 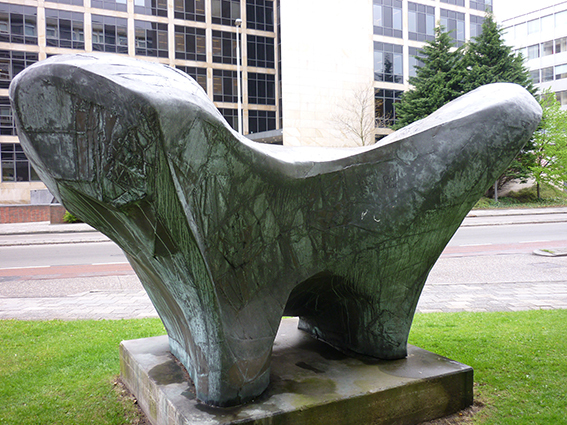 Sculpture: “Zetel der Rijks Belastingen” in Leeuwarden. In 1971, by architect Zandstra built a complex of three office buildings in Leeuwarden. 1% of the construction cost was spent on art in or at the building. This architect wanted at each building its own art work. He was looking for artists from outside the province or even entirely outside for The Netherlands. When they heard this in Friesland soon action came from the cultural world there. Especially the Director Mrs. Faber has argued to a frieze happen. From a selection of photographs by various artists is ultimately the choice cases on Sies Bleeker, Harmen Abma and Hein Kocken. To me the tax building was assigned. I was allowed to make a sketch design for there. On the basis that it had to be my typical work (style). I was then about 5 years of the Academy and this would be my first major contract. What it should be an abstract (non-figurative) sculpture had it to be; That was all my work in that time. A monumental sculpture that would equal in terms of shape and size are relative to that large building, that was my command. I had determined that it had to be a contrast (accent). I allowed myself to be inspired by the typical concrete arched form, the slightly sacral space formed between the pillars. This Vault-form is as it were the reverse back in a stand-alone bronze contra-form. You can see that the best if you’re right for the statue. At that time, I was very impressed by appearances-symetry, a symetry that everywhere in nature. That I could here, as contrast with the pure symetry in concrete, par excellence. There is a sketch design made by me in steel about 25 cm. high, (In the possession of the architect.) The sculpture, I initially wanted also in steel, (rusting iron in combination with concrete) That seemed to me a bit … However Zandstra was not pleased by the idea and he has managed to talk out of my mind. And so in bronze! There was a problem. As this statue would have to be cast in bronze, then it would cost only for Bronze casting more than a few hundred thousand guilders. And as budget there was only fifty thousand guilders available! (incidentally in Friesland when a lot of money for art). I was at that time already experimenting with self-supporting bodywork (carosserie) in steel or brass. This means to sheet material (3 mm) to force in shape into large pieces, forging, welding and to put together. It’s like shipbuilding, but also the bodywork of a car has agreements. It is an extremely cheap way in order to be able to work very large! And it is still successfully used by me. As with building a ship you start at the bottom and let it grow slowly. Later it was popularly: It called the vertebral. Until I own the title figured out: ‘seat of national taxes’. The statue is often climbed by children and you can them find there like a King in their seat. There is not more to say about it. I also think that every viewer should see his own image, so actually I already said too much.